RONN Motor Group, Inc. (RONN), today announced a partnership with Fathym, Inc., a leading provider of IoT solutions, to integrate mobile weather sensors and forecasting into RONN Motor Group’s fleet chassis. The companies will co-develop an “Edge” IoT service platform that drives decision intelligence and driver safety features back to the Electronic Control Unit (ECU) within the vehicle. RONN Motor Group Inc. is the automotive company behind the eco-friendly Scorpion, which features one of the most advanced real-time hydrogen fuel enhancement systems to date. The company is evolving the Scorpion into an all-electric roadster called the Phoenix, which will be equipped with a hydrogen fuel-cell range extender intended for a total estimated range of 600 miles. The Phoenix, will serve as the platform for RONN’s eco-daily drivers (EDDs), the next generation of affordable and environmentally friendly vehicles, as well as minibuses and commercial trucks. The partnership uses Fathym’s WeatherCloud mobile sensor technology and in-vehicle road weather forecasting and warning system. The WeatherCloud service will deliver real-time observations and predictive pavement information to the RONN Motor Group vehicle platform. This data is ingested and managed by the onboard ECU to dynamically setup up the car for observed and predicted pavement traction. Additionally this partnership provides Fathym unique access to Controller Area Network (CAN) bus data generated by fleet vehicles. This additional real-time data further enhances the Fathym WeatherCloud road forecast model and the machine learning behind it. The WeatherCloud forecast data and real-time alerts will enable drivers to take the necessary precautions needed to ensure that they arrive at their desired destination safely, all the while maintaining RONN Motor Group’s commitment to creating globally-conscious unparalleled performance vehicles. “Mainstream road forecasts are typically based on precipitation models, but the actual conditions of the road can vary drastically by location, down to a half kilometer resolution. Snowy precipitation conditions do not always equate to snow-packed roads, for example. Fathym’s WeatherCloud forecasting model uses pavement modeling and sensor data to deliver hyper-local road weather forecasts. This technology aligns perfectly with the RONN Motor Group strategy to dynamically setup the vehicle based on pavement friction. WeatherCloud provides drivers and fleet managers increased visibility that to date has been lacking,” says Fathym CEO, Matthew Smith. The companies will also collaborate to improve manufacturing efficiencies. As RONN Motor Group focuses on reducing manufacturing and development costs by up to 50 percent, Fathym’s data collection, management and analytics capabilities will play an integral role as a means to diagnose inefficiencies and gaps in quality control. As a result, manufacturing plants will assume optimal operating levels, ensuring higher quality and productivity, and reducing energy emissions and resource wastage. “Fathym’s WeatherCloud solution brings a unique suite of technologies and cloud services to RONN Motor Group that will accelerate our cloud service ecosystem and applications, and integrate specialized technology to dynamically setup our vehicle platform to significantly improve driver performance and safety in adverse weather conditions,” said Ronn Ford, Chairman and CEO of RONN Motor Group. On May 1, 2017, RONN Motor Group launched a Regulation A+ Mini-IPO that gives anyone the opportunity to invest in its company. Investment opportunities that were previously limited to high net worth individuals are becoming much more accessible to everyday investors through Regulation A+. The new rule enables both accredited and non-accredited investors to invest directly in early-stage companies at ground level. To learn more about investing with RONN Motor Group, go to http://www.ronnmotorgroup.com. As a world leader in hydrogen technology, RONN Motor Group is joining the race to reduce our carbon footprint and greenhouse gas effects by creating sustainable energy that will take us into tomorrow through the development of all electric-hydrogen zero-emission long-range automotive and transportation platform designs. 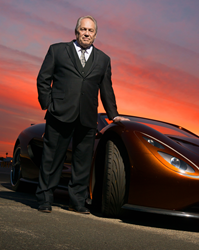 RONN Motor Group was founded in 2013 by Ronn Ford, a 50-year automotive industry veteran with 25 years specifically focused on luxury automobile. Based in Boulder, Colorado, Fathym is an innovation platform for the rapid development and deployment of enterprise Internet of Things solutions. Fathym’s WeatherCloud solution combines proprietary algorithms and machine learning with sensor and atmospheric weather observations to provide the only globally-scaled road and atmospheric weather forecast system in the world. Road Route and Point (geo-specific) forecasts are available via easily-accessible APIs and user-friendly dashboards.